General Motors has to replace the battery packs in every Chevrolet Malibu, Saturn Aura and Saturn Vue hybrid sold since 2007, some 25,800 U.S. vehicles. The problem? It doesn't have enough packs to fix what's broken. UPDATE below. GM has sold these "mild hybrid" models since 2007 with the passion of steamed broccoli. Basically a big alternator and a small battery pack, the mild hybrid systems cost more than regular models yet offered far skimpier fuel savings than full hybrids from Toyota and Ford. Even with federal tax credits, customers faced a long haul to break even on fuel savings alone. The Aura and Vue died with Saturn, and GM put the Malibu Hybrid on hiatus, but spread a few around to fleets, like New York taxicabs. In July, GM told the U.S. Environmental Protection Agency that the nickel-metal hydride packs in those hybrids could crack, leaking battery electrolyte and cutting their power. A similar problem at supplier Cobasys forced a GM recall back in 2008. Because the batteries are essential to the vehicle's EPA fuel economy ratings and emissions system, GM has to replace all of them regardless of whether the packs are leaking yet. Today, GM sent the above note to dealers that a tipster shared with Jalopnik, announcing it was pausing the recall because "a shortage of replacement batteries is at a critical level and will probably not improve in the foreseeable future." 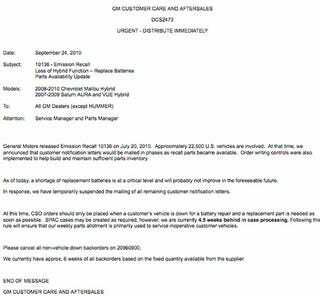 Letters to customers announcing the recall have been halted for now. For owners whose batteries have failed, GM estimates it has a backlog of 4 1/2 weeks worth of claims waiting to be processed, and only a six-week supply of batteries to fill orders once processed. UPDATE: GM spokesman Alan Adler said its supplier could only build 504 packs a week, meaning that the full fleet replacement will take several months. Adler also said the problem was more likely to happen in warm-weather states, and that GM was trying to ship the available batteries there. "We're trying to make sure we get them to the people who need them first," Adler said. Government documents put the number of recalled vehicles at 22,500, but Adler said GM's figures were 25,813.